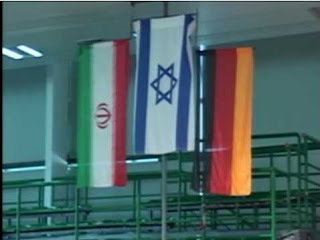 Here's a picture you won't see often: the national flag of Iran next to (and on a lower level than) Israel's flag. During the World Masters Weightlifting Championships in Poland in an unprecedented move, an Iranian athlete took his place on the medal podium beside an Isreali athlete drawing criticism from Iranian authorities. Iran's Student News Agency (ISNA) reported that Hossein Khodadadi, Iranian representative in the Masters Weightlifting Championships stood beside his Israeli peer in the medals ceremony. The event which took place in early October was in the 105 Kg category for the ages of 35 to 39. Sergio Britva, Israeli weightlifter took the first place lifting 300 kg in total and Hossein Khodadadi, the Iranian weightlifter took the silver medal lifting 296 kg. Khodadadi appeared on the podium to receive his medal beside the Israeli athlete and this move led to serious criticism from Iran. Iranian athletes have often run into difficulty refusing to confront Israeli opponents in other world championships. In the competitions in Poland, all of the Iranian participants received medals. Head of Iran's National Athletic Organization had earlier written a letter to the Supreme Leader, Ayatollah Khamenei, to receive instructions on how to handle situations where Iranian athletes have to confront Israeli athletes. Iranian athletic community has become more and more concerned about political restrictions costing them medals in competitions. The [Iranian] reformist daily Mardom Salari dedicated its editorial to the incident, wondering why it took a whole month to uncover and deal with the affair. The editorial said that all those responsible for the issue—from the Foreign Ministry and the Physical Education Organization to the team coach—must provide answers. The daily strongly criticized the head of Iran’s Weightlifting Association for taking no action about the issue until it was exposed on the media (Mardom Salari, October 23). 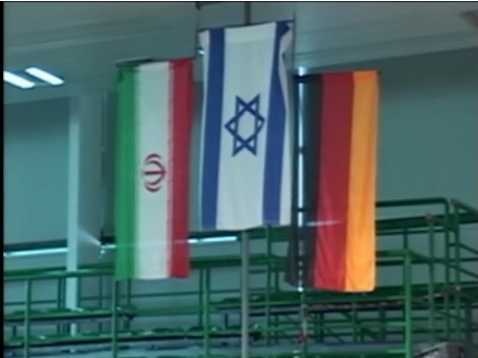 Here's the video, where you can see the Iranian refuse to shake hands with the Israeli. For good reason - it would have ended his career, and maybe his life. It is still fun to know that he had to stand respectfully during the entire playing of Hatikva.